Only I could choose a totally different career path that is going extinct. The death of the newspaper industry has been well-documented and to my surprise, even has its own Wikipedia page. Which is why ninety percent of you don’t even read a newspaper, only what is posted online. That’s fine. Local papers, however, need you. Well. . . not really. They need advertisers. 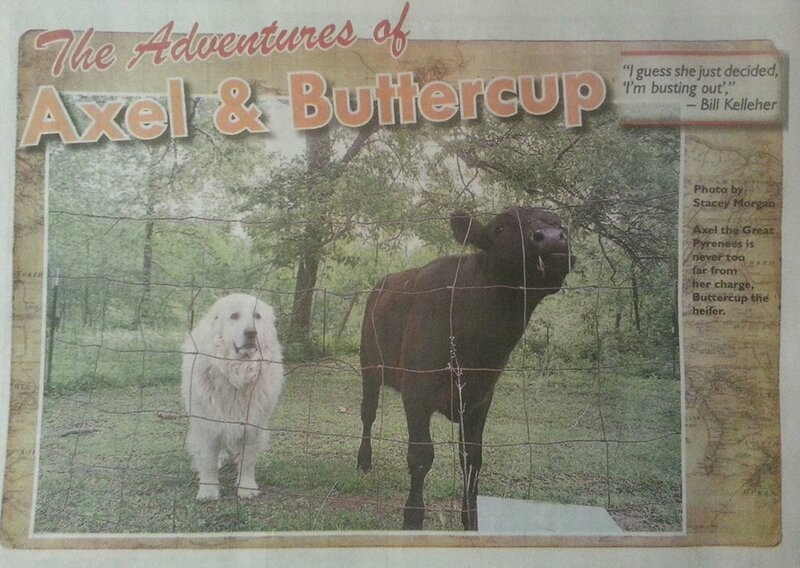 The story of two animal friends was a feature article I wrote a few months ago that had a big response. Yes, I said it. Newspapers don’t need you to buy a 50 cent copy of their paper. They do need advertisers to buy a $50 dollar spot though. Or a $10 or a $200 spot. Advertisers, not subscribers, drive newspapers. Don’t believe me? Think about all the papers that are free. They don’t need subscribers. Newspapers were created for subscribers, not advertisers. Their purpose is to inform readers, not only of things they want to know, but things they need to know. I know most of the under-40 crowd doesn’t even consider buying a newspaper in print, but for small communities, the local paper can’t be beat. From high school sports to Little League and Pee Wee football, small town newspapers are usually the only media source covering the games. Big city papers and television stations can’t (and won’t) publish pictures of little Johnny as he pitches a no-hitter or highlight the high school basketball team in a special section once a year. Small newspapers are the only media outlet that cover local businesses’ grand openings and happenings in the town’s government. Is the big city paper going to attend a work-study or council meeting and put the decisions online? I think not. It’s hard to find on the internet who won prizes at the Fishing Rodeo, how Farmer Joe’s heifer did at the county fair or who made the honor roll at the elementary school. Your local paper gladly reports on these events though. Let’s get honest. The curiosity of people is insatiable. The arrest records are still interesting to most folks. They scan them to see if their neighbor has been accused of a crime. Locals want to know who lived in the house across town that was robbed or who was involved in the terrible accident that had traffic blocked for hours. Local newspapers capture the spirit of a community. If you’re a citizen that treasures your town, then I suggest you buy a newspaper every now and then. Pay attention to those advertisers and frequent their establishments. Tell them that you saw their ad in the paper and appreciate their support of the community. If you’re a business owner that cares for his or her community, then I recommend you buy an ad in your local newspaper. It not only helps your business, but in a tangible way it is supporting the community.